LONDON – In Howard Davies’s suspenseful and moving production, Arthur Miller’s 1947 play “All My Sons,” which tells of a man who puts his own and his family’s well being above his responsibility to others, remains as powerful today as it was coming right after World War II. Providing the proper safe equipment to the military in combat is as important today as it was back then and when Joe Keller (David Suchet) decides to let cracked cylinder heads be shipped out he sends 21 airman to their deaths. Then he lies about it and blames his hapless partner who is prosecuted and sent to prison. Miller lets the truth of Keller’s crime emerge gradually as the play first presents Joe as a hearty soul and successful businessman well liked by his neighbors. Designer William Dudley places the Keller family in the backyard of a comfortable suburban home with tall, embracing trees and real grass. Joe lounges with the paper and smokes his pipe, sharing banter with the folks next door and playing games with the local kids. The only cloud in the picture is that Joe’s wife Kate (Zoe Wanamaker) clings to the belief that their oldest son Larry, whose plane went down in the war, will one day return. That’s a particular problem for younger son Chris (Stephen Campbell Moore) who has waited patiently for three years to ask Larry’s girl, Ann (Jemima Rooper) to marry him. Ann arrives having accepted Larry’s death but then George (Daniel Lapaine), the son of Joe’s imprisoned partner, shows up demanding a showdown. With genuine artistry, Miller unpeels the onion of Keller’s life to its decaying core and director Davies keeps the revelations coming with escalating suspense. Miller’s theme of how profit and the desire for good standing in the community can swamp personal responsibility and destroy families plays out with growing tension and sadness. Suchet shows with great skill all sides of Keller’s character from the cheery bonhomie of a man at ease in his personal domain to a sharp-suited businessman quick to make hard decisions to a frail, crumpled creature whose fabrications have finally been undone. Wanamaker uses sly glances to obscure the reasons for Kate clinging to the belief that her son is still alive and manifests keening grief when the truth emerges. Rooper combines prettiness with hints of steel, Lepaine is credibly angry and Steven Elder adds a balancing note of suburban angst as a neighboring doctor too settled for his own liking. Best of all is Campbell Moore who tackles commandingly the difficult role of the decent and idealistic son. In a memorable performance, he appears to grow physically from being a genial fellow who goes along to a man with the backbone to demand honesty and learn how to deal with it. Venue: Apollo Theatre, runs through Sept. 11; Cast: David Suchet, Zoe Wanamaker, Stephen Campbell Moore, Jemima Rooper, Daniel Lapaine; Playwright: Arthur Miller; Director: Howard Davies; Set and costume designer: William Dudley; Lighting designer: Mark Henderson; Music: Dominic Muldowney; Sound designer Paul Groothuis. 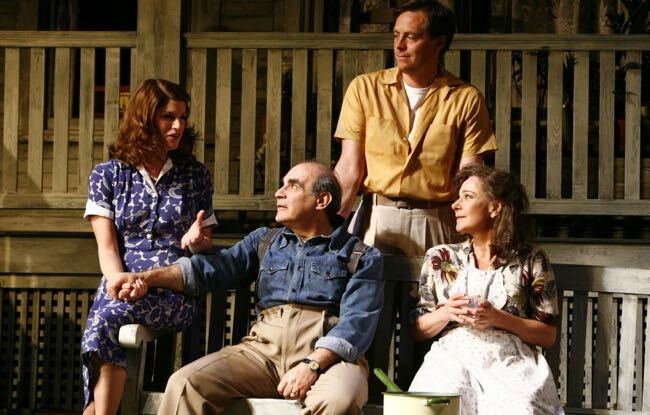 This entry was posted in Reviews, Theatre and tagged 'All My Sons', Apollo Theatre, Arthur Miller, Daniel Lapaine, David Suchet, Howard Davies, Jemima Rooper, Stephen Campbell Moore, Zoe Wanamaker. Bookmark the permalink.